We understand in today’s fast paced world time is precious. 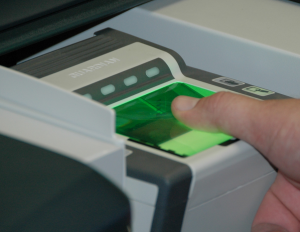 KENTECH respects your time therefore uses the latest biometric Livescan technology equipment to capture your fingerprints and have you out minutes with minimal waiting. We provide convenient online scheduling with extended weekday hours and Saturday appointment availability. We provide a quick and ink-less process for individuals to get fingerprinted. PERC (Permanent Employee Record) For security guards, etc. NOTE: We currently Do not print for IL Department of Children and Family Services (DCFS) , Chicago Public Schools (CPS), or IL Dept of Public Health (IDPH). Please check their respective website for a list of their contracted fingerprint vendors. Accuracy – Driven to 100% accuracy on all prints preventing repeat visits. Great Customer Service – Guaranteed highest print quality by a KENTECH Certified Fingerprint Technician. Convenient Downtown Location – Our locations are connected to CTA trains and buses or free parking available. Same Day Availability – Get your prints done same day no waiting.